Everyone who attends Performance-based Hiring for Recruiters (Recruiter Boot Camp) training program is automatically enrolled in our Performance-based Hiring recruiting community. All members receive one-year, 24/7 access to our enhanced online Recruiter Toolkit, plus those that attend all 4 modules, get personal coaching to become Performance-based Hiring certified. In addition, these members can attend any Performance-based Hiring for Recruiters workshop throughout their year of membership. We also have special low renewal rates for alumni of Performance-based Hiring for Recruiters. This is your training and tools dashboard. Login to your online training. Keep track of your Performance-based Hiring certification status. Review recordings of the online course. Access Lou Adler’s Wild 'n' Crazy Ad Wizard and Recruiter’s eHandbook. Download forms, tools, and templates. Send your candidate Lou’s “Getting Ready for the Interview” prep video and have private access to our growing recruiting resource library. Becoming Performance-based Hiring certified is the key to becoming a better recruiter. Benchmark yourself using our online scorecard to see where you stand. You’ll be 10-15 points better after becoming certified. To make it through this process you’ll work on a real recruiting project and we’ll support you every step of the way. When you’ve successfully finished this program you’ll be 50-100% more productive and able to recruit and close top performers in any job class. More important, you’ll become a true partner with your hiring manager clients and a trusted career counselor for your candidates. We have a real coach reviewing your recruiting project work and providing advice and counsel. The key to becoming Performance-based Hiring certified is preparing a performance profile for a real search project, developing creative sourcing tools, and learning how to overcome key objections and concerns. Learning applicant control is a key part of this. Our coaching team will help you navigate the basics. During your first year of membership, or annual renewal, you’re invited to attend any Performance-based Hiring for Recruiters program. *Please Note: Memberships are non-transferable. Alumni, maintain your privilege to attend any Performance-based Hiring for Recruiters Online class at no additional charge, and don’t miss a beat! Purchase this full-year training and tools dashboard renewal. 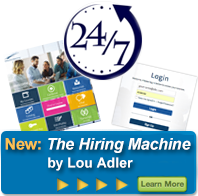 Access Lou Adler’s Wild 'n' Crazy Ad Wizzzard, Performance Profile Wizard, and Recruiter’s eHandbook. Download forms, tools and templates. Send your candidate Lou’s “Getting Ready for the Interview” prep video and have private access to our growing recruiting resource library. Performance-based Hiring Alumni pay $360 for the year. Renew now!